Link a Wi-Fi router to each 1Gbps connection for two high-speed wireless networks across your home. Get performance and convenience for homes with multiple rooms and floors. With the 2 connections of our 2Gbps bundle, it’s now easier than ever to manage internet access under one roof. Devote 1Gbps for what matters most and share another 1Gbps with others. A first in Singapore in terms of affordability and speed, the powerful connectivity and options provided by our 2Gbps bundle will transform the way you access the internet. 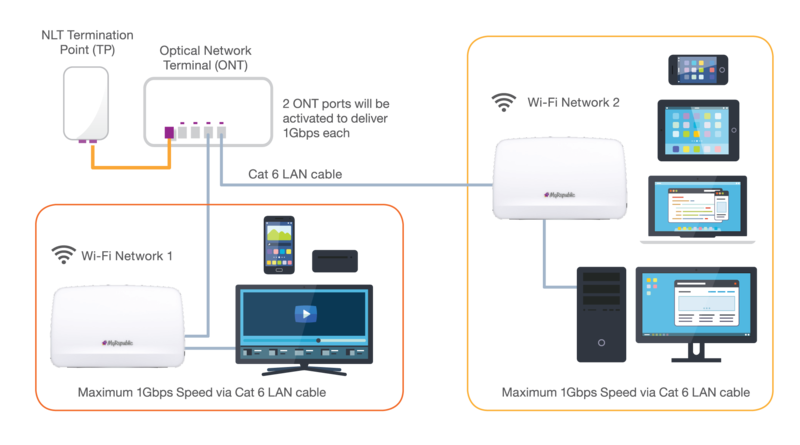 Connect a Wi-Fi router to each 1Gbps line to power two Wi-Fi networks. Extend your wireless coverage across across multiple rooms and floors without compromising on speed. Get unlimited free local calls and amazing IDD rates with MyRepublic Home Voice. Number porting is also available. With MyRepublic Dual Fibre, get 2 new powerful Wi-Fi routers at a great discount to support faster speeds and boost your wireless coverage. Get a professional assessment of how cabling work should be best done in your home. Pay only if you choose to accept the quotation for the cabling services. Safeguard all your devices with F-Secure Internet security and enjoy up to 60% off F-Secure plans. Get your Static IP at no monthly cost as long as you’re MyRepublic customer. All it takes is a one-time installation charge of $50. Note: Cancellation fee of $50 applies if you terminate your Static IP add-on within 1 year of installation. Lowest IDD rates in town. Get up to 1000 minutes of IDD calls per month.